Company Name:Indarsen Shamlal Pvt. 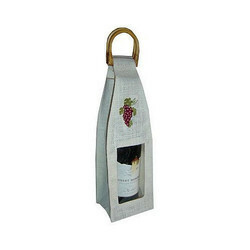 Ltd.
Jute bag for holding 1 bottle or jar turns your products in to a profit generating gift at any time of year. The handy carry handles means that there is no need for excess packaging and the jute bag can be used time and time again. We offer an exclusive range of eco friendly packaging bags that are made from reusable material that allows the user to use it again and again. The material used does not harm the environment and are produced in free trade. We bring forth an unmatched collection of the designer eco friendly bags that are not only environment friendly but also stylish at the same time. Sea Grass Water Holder Bag - 10" x 6" x 13"
To cater the variegated demands of our clients, we are highly engrossed in manufacturing a wide range of Jute Bottle Bag. 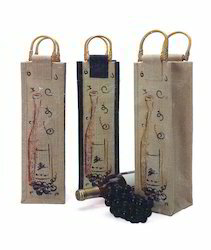 We are presenting the optimum quality assortment of Bottle Bags. These products are fabricated by professionals who utilize the superior technique and reliable input which is sourced from industry.